The whacky tabacky growers have this all figured out. Thank you for the Mylar link, that may be a great idea if yu agree it will help. I think it would be a pain to deal with myself, but it would help keep light in. My first choice would be more lights. The dreaded light reflector debate. For one thing the light you see is not the light the plant sees or needs. Unless it is perfect and very expensive at that, a flat white surface is far better than foil or a mirror to reflect the light the plant sees and needs. I used a towel on top of my frame and white paper plats for reflectors on my 12 CFL's I used. I put painted white card board on the sides. This worked by far better than anything I have ever used before. The plants didn't even care too much how far away the light was. With 1200 watts of light in that small of a space you simply cant go wrong. Hammered style of films are best. For the return in your investment and cost the white paint is the best I have been growing indoors on and off for over 30 years. The very minute they legalize weed in Texas I am going to light up one the size of a baseball bat. Last edited by Worth1; June 16, 2016 at 06:32 PM. What would I paint it on? I have used everything from card board to sheet rock. Ed Rosenthal literally wrote the book on this stuff. I don not break any laws in the state of Texas lets get that clear. To go along with the plain white idea, I rigged roll down opaque white (blackout) shades that I got from IKEA. Super easy to roll up out of the way and down when I am done. I only grow seedlings indoors for the 3 months before plant out so I don't know if my setup is good enough for an all year indoor greenhouse which I think is what you're wanting to do. In the pic below you can see the rolldown shade... the back is just the white wall... complete with little fans to help everyone get strong! Last edited by luigiwu; June 16, 2016 at 07:46 PM. My rack looks just like luigiwu's, except white rather than chrome. A 4 lamp T8 fixture just fits between the uprights and will cover two 72-cell starter flats or one plus a 18 pot case. I use two 6500K and two 4800K lamps, though I don't really believe the spectrum theories rampant among the whacky growers. The rack is up all the time but I only mount the fixture in late Jan early Feb when I start the slow C.chinense varieties and it goes back in its box when everyone is planted out (or in my case potted) around the end of April. Then the rack will go outside for cases with up to 6" pots. 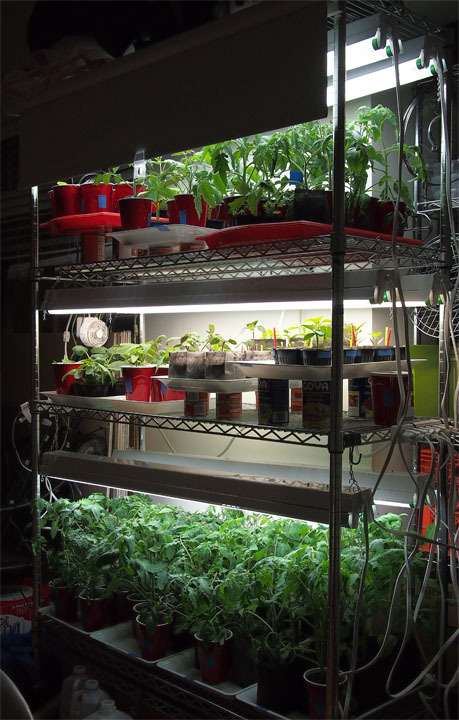 These racks have adjustable shelves so last year it was able to host plants 2' tall. The attachment shows the setup in action last year. Kindly ignore the cat tail; I am infested with a furry pest. Now, I have seen a freestanding light stand that looks like two uprights between which is suspended a fixture on pulleys so the height can be adjusted. But I think it only supported a 2' fixture, which is kinda pointless IMO. Nevertheless, you could cobble something together from 2x4s that would do what you want. BTW, I have zero problem with "leggy" plants in my setup. If anything, most seem to want to spread and luxuriate instead of shoosting up into the sky. I'm such a newbie compared to you folks. I set up a shelving unit this year for the first time and used the Costco LED shoplights. They worked really well, and never got hot, which was good, and didn't burn the leaves that were very close towards the end. Also, very economical. I used books underneath for raising the plants, when I didn't want to bother with adjusting shelves, and towards the end, it got difficult because the plants were so tall. I'm in the Chicago area, so I couldn't put them outside until the very end of May.